Lately, my social media outlets have been crowded by this “Too Pretty for Homework” t-shirt slogan that has all the mom-blogs in an uproar. As you know, this is no mommy blog. However, when I see things like this out there, it makes my feminist vibe shoot straight up my spine and practically sprout antennae like an overgrown ant. Yes. If you couldn’t tell from my writing, I am a feminist. I believe the best definition I have ever seen for feminism came from a bumper sticker which read, “Feminism is the radical belief that women are people.” Last time I checked, I am female AND a real thinking, breathing person, so I guess I qualify. I would have never counted myself among the super popular kids in school, but I had a lot of friends. I went to the same schools for 12 years, so throughout the years, I circled around and was friends with nearly everyone at some point. Still wouldn’t click off “popular” on a survey. I also grew up knowing that I was a pretty smart cookie, even if I wasn’t in every one of the smarty-pants classes. But, I got by. High school wasn’t always the best of times, but it wasn’t always the worst of times, either (See, Ms. Swalin – I read that book! At least the first page). Growing up is tough at the best of times. Why do things that make it even harder? Back to my original hackle-raising point: These stupid slogan t-shirts, while meant to look cool, or perhaps help you fit into the “it” crowd are really setting us (women) back. A lot. “Oh honey, don’t worry about passing the eighth grade! You are so pretty you will never need to know how to balance a checkbook!” And she won’t. Because no one learns that anymore. 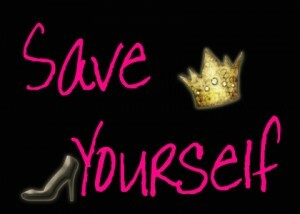 I started this blog, Self Saving Princess, so that women and girls alike could be empowered to stop waiting for the handsome, yet often terribly tardy princes to come and save them. Slip on a pair of running shoes… shimmy down the drain pipe on some sheets… and get the hell out of there! Save yourselves! Half the time the Prince is a dim-wit anyway, and who needs that kind of stress? I, personally, would rather be empowered to do my homework (aka LEARNING), and have self-confidence rather than prance around in a little bubble of “pretty” that is supposed to get me through the rest of my life! BTW: The lack of learning leads to brain rot… which invariably offers a fair comparison between your brain and a box of rocks. PS – The rocks are smarter. Oops… I guess that was a spoiler alert. So, my advice is that moms stop BUYING these silly shirts. I get the value of a snarky slogan t-shirt and my closet is filled with them. However – Going back to just being a pretty face? How many years have women struggled with their own civil rights and the right to a harassment free workplace where she could actually become the boss based on her accomplishments and merit? Here’s a hint to those who want to “pretty” their way to the top – Pretty may land you a job, but you will instantly be seen as incompetent once they realize you can’t DO the job. The second that happens, you will hit that glass ceiling so fast you will be picking glass out of your frosted tips for the next 18 years. You rarely see a high school age boy wearing a t-shirt that says “Too Handsome for Homework.” Why is that? Because boys are expected to learn as they go, marry the pretty but rock-headed wife, and take all the cool corporate jobs? I call shenanigans on that mess. Girls in this country have every freedom freely awarded to boys. But we have to work harder for the recognition, fight harder for our sports to count, and then we have the dishonor of being paid less that what a man in the same job is paid… all in the name of a man taking care of his family. I have always been a primary bread-winner for my family. Both when I was married and supporting my deadbeat frog, and then again when I became a single working woman trying to make it on her own. Now, I am a self-employed person engaged to another self-employed person – We HAVE to make ends meet. How could I do that if I let my looks turn me into a totally self-absorbed space cadet?? The answer? I couldn’t. I don’t want to sit around and hope that some big, strong, rich man will save me from the tower so I can live happily ever after… staring at my own reflection in some big creepy Disney mirror somewhere. Being a self saving princess means being smart, and not afraid to SHOW how smart you are. It means taking pride in yourself and your own abilities, and never letting someone tell you that you are less than. The prettiest girls I know are the ones who are smart, confident, and sassy. They are gorgeous inside and out because their value shines like gold on a crisp Spring morning. They aren’t afraid of a little hard work and understand that is how you get where you want to be. I will happily prance off my soapbox now and await the multitude of comments from mom’s who are reliving their uncool teen angst years through their tween daughters who will think that I need to get a chill pill and probably some Botox. Because I have always LONGED for a face that looks both dead and surprised all at the same time *snark*. So flame on. I will take intelligent, witty, funny, and sassy over pretty and super popular every. day. of. the. week. This entry was posted in Bitchfest Wednesday and tagged bitchfest, fairy tales, hard decisions, Idiots, Princess, save yourself. Bookmark the permalink. This makes me feel guilty. And no I wouldn’t even put a t-shirt like that on my dog (another strong female presence in the house). I feel guilty because I know it is wrong, and I am so disgusted by it, yet watch Toddler in Tiaras with morbid fascination … But I can’t look away!! Plus, I’ve noticed that most of my “pretty” but uneducated acquaintances are the ones that either aren’t married OR are in bad relationships but have no where to go. Men don’t want, or respect, just pretty anymore.